LEGO and pixelated video game characters are as delicious a combination as chocolate and peanut butter. The non-Salmonella peanut butter that is. So when Tristan started asking me to help him build an original LEGO creation to mail in to the official LEGO Magazine, I jumped at the opportunity to suggest that maybe he create something gaming related. Here's a break down of how Tristan and I turned a picture into a sizable piece of plastic art. Choose Your Character Carefully: You want to make sure whoever you're transforming into a LEGO is going to use colors that not only exist in the LEGO universe, but that you either (preferably) own or can easily purchase. LEGO are pretty damn expensive, so keep that in mind if you're going the purchase route. Also remember that unless you have a LEGO store nearby, you're going to be forced to buy kits or sets that have all kinds of colors you probably don't need. We spent $50 on supplemental LEGO making this, that gave us about a third of the LEGO we needed. Find A Picture: After decided Sonic was the way to go we searched out "Sonic" and "pixel" on Google. 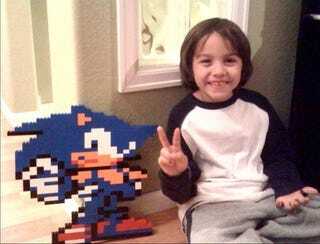 It didn't take long to find a pixelated picture of Sonic. We were lucky to find one that already had a grid laid over the image. If yours doesn't you're going to have to do that yourself. That way you can easily count and track how many bricks you need of each color. Find the Time and Space: It took us about six hours or so to make Sonic. Six hour bent over a coffee table. Next time we're using the dining table. Fun: Let's not forget the real reason you're doing this, if you're doing it with a child. It's not really about bonding LEGO as much as it is about bonding families. Make sure you don't get carried away and have your child or children watching you put together his creation. You find the pieces, they place them. LEGO: You're going to need a lot more LEGO than you realize, unless you actually sit down and count each and every brick. It's best to locate every single brick in your house and go ahead and pull out the colors you'll be needing. Aspect Ratio: When we started I decided to tweak the brick count going across but not up. In other words, for every square I used two pegs instead of one. So a single square shown in the picture meant I used a two by two brick. The end result was a slightly squashed Sonic. The thing is, after much examination I'm convinced that had I left it alone or doubled both I think it still would have had a squishy Sonic because it doesn't appear that bricks are perfectly square. Either way, that's an important decision you're going to need to make before you get started. Keep in mind the bigger your creation is the more expensive it's going to be. How Thick Are You? : You're also going to need to know how thick you want to make your creation. Tristan and I made Sonic one brick thick. Which worked, though he can't really stand up on his own. Dot Your Bricks: I found the best way to track where I was on the picture was to draw a little dot on each square as we placed the bricks. That way I knew which ones were in place and where exactly we were. I still had to tear apart the Sonic twice to fix problems. So make sure you check and recheck placement as you build. Wrapping Things Up: As the winner of the LEGO Bald Bull can attest, these creations are very fragile. Tristan and I used three coats of industrial strength spray on glue to keep Sonic together permanently. Sure one side of him is white, but the other is still glorious and perfect for hanging on the wall. We&apos;re a week away from the second annual Denver Funde Razor. If you do make one, let us know. Maybe post a picture in this thread. I'd love to see how they turn out.